Homage to H.H. Dorje Chang Buddha III! Homage to the greatly loving and compassionate Guan Shi Yin Bodhisattva! I am very grateful for having the good fortune to attend the Guan Yin Bodhisattva of Great Compassion Empowerment Dharma Assembly led by Great Dharma Master Ruo Hui. When the dharma assembly started, I performed the instructed movements for a while. Then my arms felt very tired. I relaxed my arms. Gradually, I felt some cooling air around my arms and also sensed a little static electricity. After a while, the feeling vanished. I still stood there relaxing myself. A while later, I again felt cooling air circulating around my arms. My hands began to tremble and felt more and more numbing. My body also followed to waver forward and backward. The wavering was like being driven by a kind of invisible force and like wavering along with the sea wavers in the ocean. I was unable to control myself but my feet were still standing at the same place. When the wavering magnitude of my body was too big, I lost my center of gravity and felt to the ground. However, the fall did not cause any pain to me. While lying on the floor, my ears started to have a kind of numbing feeling. There was also a force pulling my head to lean back. I continued to lay there to enjoy the numbing feeling on my own. The feeling was very comforting but disappeared gradually. 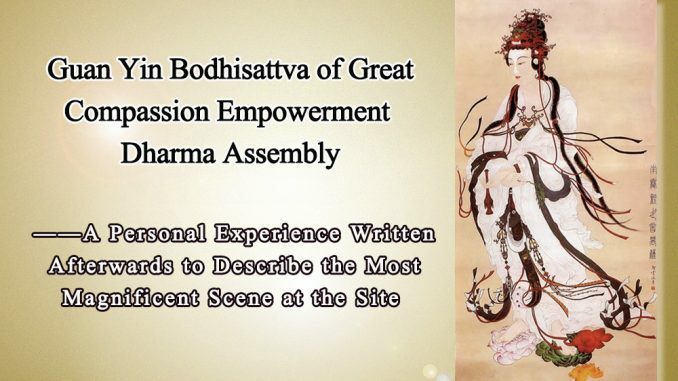 I thought this was the empowerment from Buddhas and Bodhisattvas because I had suffered serious illness in the past. Therefore, I stood up and prostrated toward the direction of the Buddha statue. Then I returned to my original standing pose. Suddenly, an image dressed with very brightly beautiful and good-looking clothing appeared before my eyes. I was not able to see the face of the image but could tell that the style and colors of the clothing was very beautiful. Actually, it was more beautiful than the dresses I had seen before from the statues of Bodhisattvas. At that time, I thought I must have seen a Buddha or a Bodhisattva. Thus, I immediately began to prostrate. During the entire process, I kept my eyes closed. I heard very wonderful and ear-pleasing singing as well as crying and laughing. Sound of body movement was also heard. I also generated the joy of dharma for the empowerment received by other dharma sisters. I am grateful to the empowerment from H.H. Dorje Chang Buddha III and the greatly loving and compassionate Namo Guan Shi Yin Bodhisattva!